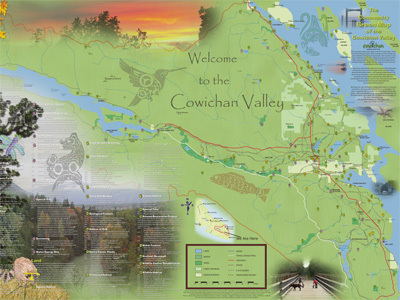 The Cowichan Valley Land Trust (CVLT) is creating a Green Map. The Community Mapping Collaboratory has been helping out with advice and instruction. Maeve Lydon, Ken Josephson and Charles Burnett gave a one-day workshop in November 2008 in Duncan, Charles followed up with a 1-day technical workshop in February 2009 and Ken with two workshops in July and September. The CVLT Mapping Team have been hard at work doing Mapping Fair follow-up mapping with a wide variety of groups. Margaret and company had a buzzing hall filled with a sorts of mapping activities and kids fun. They plan to do tons more outreach and have the next Common Ground supported Green Map printed in late summer! This Project wrapped up in early December 2009.